Having such technological innovations right on our doorstep in Surrey is a real privilege, but not as much as a privilege as it is to help launch that technology. 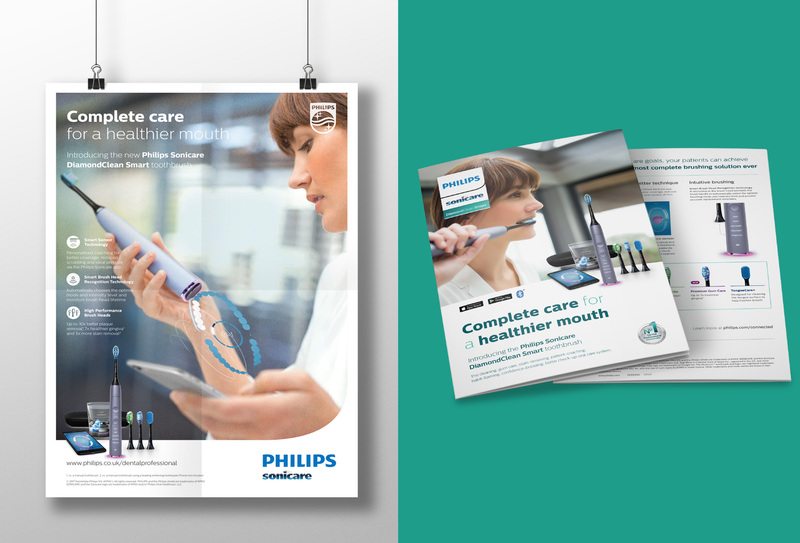 Pelling Design were enlisted to launch the latest toothbrush design from Philips Sonicare - the category leading DiamondClean Smart. The launch would cover multiple touch-points, including all design elements for brochures, leaflets, emails, advertising, animation, promotional video, emails, digital media, digital advertising, website and landing pages. Pelling Design executed all of the above work entirely in house with our highly skilled graphic designers and web developers. The Design process started with a review of all images and assets available, sourcing of imagery and planning out a time-line. Reviewing a design project of this size in detail before you start any design work is imperative. It helps setting out key targets, time-lines and outlining key performance indicators. For example, who are we the audience, what are we trying to communicate and what do we want to achieve. Once these targets have been identified and confirmed we moved into the design visual stage. We find the best way to move forward is to design a number of visual options for one or two of the pieces of collateral and establish a design style. Once this has been agreed on we then roll out the chosen design style across the multiple touch points. This is also a good way of working when the entire design team is working on 1 design project. It helps ensure that there is a level of consistency within each design piece. Being able to constantly collaborate and communicate is hugely important, and something we at Pelling Design pride ourselves on. I believe it is one of our leading strengths. Managing the time-lines was a real challenge with so many touch points needing to be ‘live’ at once. We can obviously control most of these as a result of carrying out all design and build entirely in house, but we relied on our wonderful suppliers (see here >>) to deliver all printed items and organise delivery logistics. Having great working partnerships really pays dividends when working on such high profile deliverables. Thu huge success of the launch was no surprise and we were incredibly happy and privileged to play a small, but important part, in the whole process.